Will you one day be as big as Arnold? No. No you won’t. 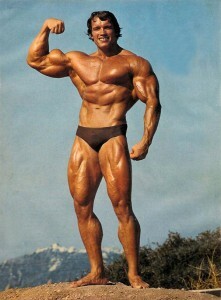 I got Arnold’s Encyclopedia of Bodybuilding when I was 13 years old. I followed his training plans to the letter. I ate the exact foods he recommended in the exact amounts he recommended. I was a zealot. Because I honestly believed if I worked hard enough, I could one day be as big as Arnold. These days I know better. No matter how hard I train, no matter how perfect my diet… I’ll never be as big as Arnold at his peak.